Alternative forms of fodder to fill the feed gap when seasonal pastures let you down; should be in every farmer’s management plan. Alternative Fodder has assessed and selected a number of perennial native and introduced shrubs and trees to further supplement your feed base. Assessment criteria includes the ability of the plant to survive tough climatic conditions once established, ongoing low input and maintenance levels, provide reasonable to good quality feed value to livestock, produce green feed that can be harvested when desired—directly by grazing animals or by cut and carry methods. Alternative methods of livestock fodder are an added safeguard to assist your management program combating the unpredictability and ravishes of climate change, offering a cheaper comparison to purchasing feed. Various forms of alternative fodder with their advantages and disadvantages are discussed below. Tree Lucerne is an outstanding multi-purpose legume which can be used as a windbreak, hedge, fodder or as display trees. They are mildly fire resistant, drought tolerant and frost hardy when mature. 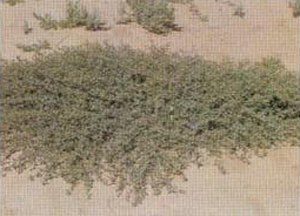 It reduces impact of all forms of erosion and is an excellent shelter plant. Tree Lucerne is mildly salt tolerant but will not tolerate water logging. The only fertiliser required is Superphosphate. FODDER VALUE: The king of tree fodders! All parts are edible. There are no reports of Tree Lucerne containing compounds toxic to animals (NSW Agfact-Agdex 125/00). The more it is pruned the better and it regenerates quickly. Highly valued as a fodder supplement for most livestock. 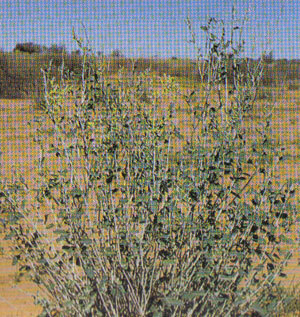 An evergreen bush with silver-grey foliage. It is mildy fire retardant and tolerates high constant temperatures. Can withstand severe drought conditions and will also tolerate shallow flooding for lengthy periods but is unsuitable for waterlogged soils. FODDER VALUE: It is high in protein and needs to be regularly grazed to maintain plants within animal’s height. It provides off ground feed for considerable periods often extending into drought conditions. Good water supply must be available to the animals at all times. Although rare some oxalates do occur so it is best to test. It recovers well after grazing and can survive complete defoliation. A prostrate perennial sub-shrub with long slender brittle stems. It has high salinity tolerance, is drought tolerant and is frost hardy when established. It is great for rocky outcrops where little other plant growth occurs. FODDER VALUE: A very useful plant that often grows in dense clusters. It establishes well on scaly and bare areas. 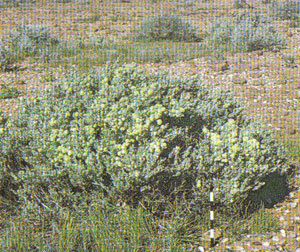 Considered one of the most grazed of the saltbushes offering a variety in diet. Good water supply must be available to the animals at all times. Although rare some oxalates do occur so it is best to test. 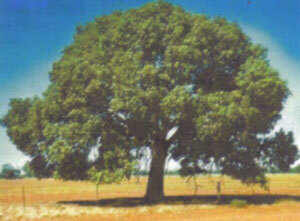 This shapely and beautiful Australian native shade tree is an excellent windbreak. It is highly regarded as a fodder tree as branches are easily lopped and livestock readily eat leaves and small branches. It is frost hardy and provides excellent shelter when established. FODDER VALUE: Has little effect on crop and pastures production so it is rarely removed when clearing land. It is useful as drought forage as it is highly palatable and nutritious. As it regenerates slowly when lopped (some 3 to 5 years) it is best to only partially lop a portion at a time. The following fodder plants are available on “an order only situation”—tubestock only. Please email/telephone your request stating species, delivery address, quantity and timing required. A perennial small shrub with brittle woody stems with grey-green white scurfy surfaces which is drought tolerant and frost hardy when established. FODDER VALUE: Usually a spring growth fodder crop although it will grow after useful rainfall in any season. Prolific qualities of seed ensure continuous plant production. It is usually eaten with other pastures and fodder as it can be a little unpalatable by itself, but good nutritious filler. As with all saltbushes always ensure stock has access to a good water supply. It should not be totally defoliated. Bluish-green perennial shrub with erect branches often tipped with golden flower spikes. Often growing with Mitchell grass, Black box and Coolibah communities. FODDER VALUE: It is regarded as useful drought resistant fodder which is not readily eaten by stock until one of the last remaining tree fodders. Capable of withstanding extended periods of partial inundation. 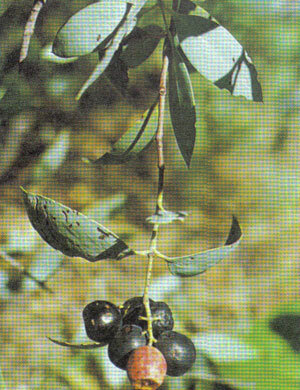 It is one of the few blue bushes where no toxins or eating problems have been recorded. 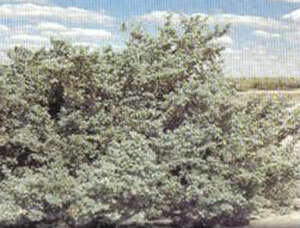 A variable small shrub to small tree depending upon soil and environmental conditions. 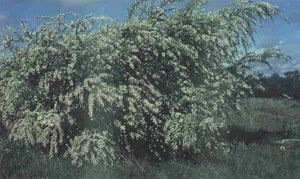 It has pendulous branches and is found in woodland communities. Timber yields an aromatic smoke when burnt. Requires a host tree as it is parasitic on the roots of other plants. Often used for incense. Well known for its oil content. Can take 20 to 30 years to mature. FODDER VALUE: Regarded as useful fodder as it is highly palatable to most livestock and has high nutrient level.